Time and time again, i've read aquarists posting on forums about finding algae, parasites, pest snails, worms and other critters invading their tanks shortly after startup... and when asked if they treated or quarantined their plants beforehand, often the answer is no. 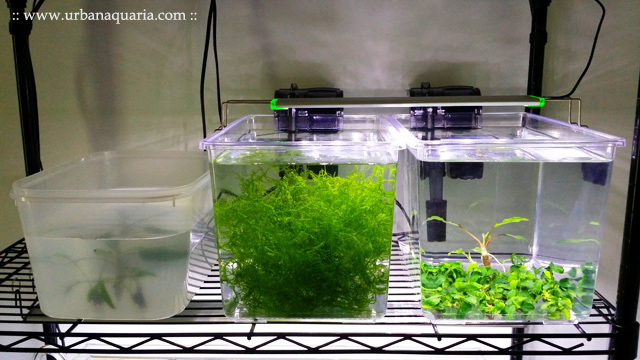 When i started out in the hobby, i also encountered numerous algae and pest outbreaks in my tanks too, and had my share of fighting uphill battles trying to solve multiple tank problems. This eventually prompted me to practice treatment and quarantine procedures for all new plants that i buy. After the new plants are rinsed and washed thoroughly under running tap water, they are put into this container. The container is dosed with anti-snail chemical treatment (to ensure that pest snails/critters and their eggs are all eliminated, i usually overdose up to 10x the recommended dosage). Currently i use ISTA snail remover (any other anti-snail treatment can be used too, just have to try various dosages and see what works). 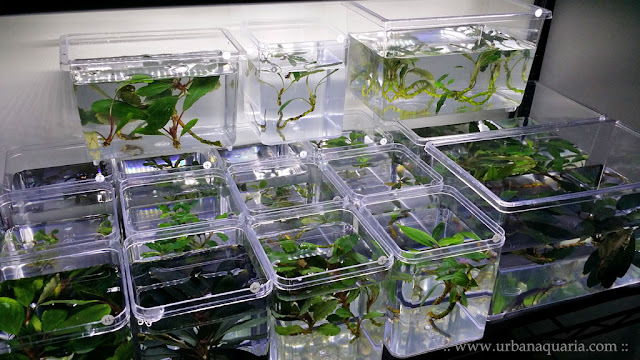 The plants sit submerged in this container for up to 24 hours. After this time, the plants are inspected closely. If any pests are still observed to be alive, i dose more chemical treatment and let the plants soak for another 24 hours. This is repeated until no more pests are observed. Once the treatment is complete, i rinse the plants thoroughly in running tap water. Next, the plants are put into this tank which has a small hang-on filter running on it. I dose anti-algae and anti-parasite treatment to weaken and inhibit any algae and parasites that may be hitchhiking on the plants. Currently i use Easy Life AlgExit and Seachem Paraguard. As there are no livestock in this tank, i also overdose the treatments up to 2-3x the recommended dosage. The plants will usually stay in this tank for up to 7 days and receive a regular light schedule and fertilizer dosing. If any traces of algae are still observed on the plants, i will extend the treatment period and dosages accordingly. Once the treatment is complete, i rinse the plants thoroughly in running tap water again. This is the holding quarantine tank. All new plants that have completed the anti-snail/critter, anti-algae and anti-parasite treatments will be put into this tank. This tank also has a small hang-on filter running on it, along with activated carbon to help adsorb the residual traces of previous chemical treatments. The treated plants will usually stay in this tank for up to 7 days (sometimes longer if they are not required for use yet). Regular water changes are done in this tank as well as receiving a regular light schedule and fertilizer dosing. Algae eating shrimps (ie. cherry shrimps and yamato shrimps) are also present in this tank to help clean up any leftover algae that may still be on the plants. Once the full process is complete, the new plants will be added to my main tanks. Yes... it does seem like a very long and tedious process (and it definitely is! ), but over the years of trying various methods, this procedure has kept my main tanks mostly algae and pest free so far... it might not be 100% (certain algae or pests do still slip though in some tanks when i'm not careful or diligent enough), but at least the chances of any outbreaks are heavily reduced. I basically utilize small plastic containers commonly used to store sweets and tidbits (usually sold at houseware stores or sundry shops) to hold each group of plants. The transparent containers allow me to monitor their treatment progress and observe the condition of the individual plants more closely. This helps to make the overall process alot more manageable and organized. That is very interesting process and requires much patience. I would like to ask if this process can be done without light schedule and filter? I mean just simplify it by soaking in treatment water, change water regularly and add some liquid fertilizer? Yes, you could also do these procedures without lights and filters. Just that during the longer periods of treatment and quarantine, without light and good circulation, some plants may not continue growing properly or might even deteriorate during the process. I guess you'll just have to experiment and see which methods and factors work best for your procedures. Hi UrbanAquaria, nice write-up & guide. I'd definitely try this out when i get new plants in the future. By the way, may i ask how do you keep you extra plants, like when you're not using them in your current scapes? Like do you setup extra tanks just for plants or just buy them? Well established holding tanks (with cycled filters) are very useful when re-scaping main tanks too, you can transfer plants and livestock over to them to live in for a few days (even up to a few weeks), while taking your time to re-do a main tank. No need to rush and setup new tanks. I like using the basic plastic tanks (like the ones i use for my treatment and quarantine procedures) as they are lightweight and also save space by being easy to stack together for storage when not in use. Wow, thanks for the ideas, often i have new ideas that i would like to try out but didn't have the space in my main tanks. Hi UA, would like to seek your advice on this matter to shorten the process, what i have in mind is to do both anti-algae and snail treatment in 1 tank at the same time, both the chemicals(ISTA snail and Algexit) will be added to water and plant will be submerged for 24hrs? will tht kill the plants like MCs and hairgrass? Well, you could try mixing all those chemicals into one treatment container at the same time... but depending on the types of plants, some might deteriorate (depending on the relative concentrations of the chemicals) while some might be okay. The initial health of the plants are also important factors too. You'll just have to test and see. Thanks for the write up! I've been wondering how to set up a qt tank. Do you think it would be a bad idea to have gravel in your stage 3 tank? Thank you! Its okay to have gravel substrate in the Stage 3 tank too, just that if parasite/infection/algae outbreaks somehow slip through (which could happen if you quarantine alot), and the tank has to be reset, there will be additional items to clean and disinfect. So it requires extra work. Thank you for your reply! How big are those plastic containers? The transparent plastic tanks that i use are around L30cm x D17cm x H18cm... works out to around 8-9 liters of water volume each. You can usually purchase those plastic tanks at most LFS. I am trying to recreate your setup. Thank you very much. I got vorticella in my tank which seems to be gone, but I am paranoid to transfer it to my new tank. I definitely don't want to throw my plants away.